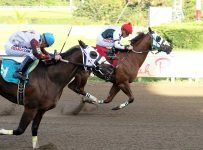 Hialeah Park opened its quarter horse race meet on Wednesday with match races and in front of a sparse audience that one spectator said was less than a dozen for the first race. According to our colleague Sheldon Glass who was at Hialeah, the program listed the names of the jockeys but not of the horses. The program did not list past performances. 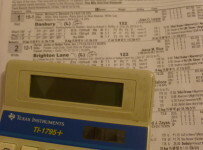 As shown in the photo on the home page (by Sheldon Glass), the TV monitors at the track showed names of horses. We are attempting to confirm reports that several horses ran in multiple races on Wednesday. The horses lined up in a makeshift starting gate with no doors, and the jockeys were given a verbal “go” command for races of 110 yards. Based on one day, those who expected a “sham” at the historic track in Hialeah, Fla., apparently have seen one. 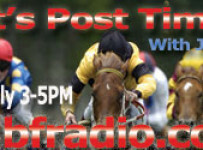 Later this week, we will have additional coverage of the racing and of related developments at Hialeah. From 2009 to 2016, Hialeah had traditional quarter horse racing. John Brunetti Jr., Hialeah’s president, last week told us that the track is making the change to cut its costs of racing. What Hialeah is doing in racing complies with the minimum requirements of state laws and regulations for it to keep its casino and card room. Hialeah is conducting it meet under a purse agreement with the South Florida Quarter Horse Association. Several of that group’s founders also are part of the horsemen’s group at Gretna Racing in the Panhandle town of Gretna, Fla.
Hialeah is following Gretna’s model of low-cost racing. Until this year, Hialeah’s purse agreement was with the Florida Quarter Horse Racing Association. Hialeah will have racing Wednesdays through Sundays from May 31 until June 25. There will be two race cards each day, both with eight races. and first post times of 12:00 p.m. and 3:00 p.m.